Monday morning as I was taking out the trash, this mockingbird was singing his heart out. I walked back and forth right under him and he just ignored me and continued to sing. I went in and got my phone, came out and he was still singing!! 81 degrees! On February 4th! I was about to head over to Rowlett and take Summer to the hospital for a hernia opperation and found Louis Dean was sitting out in the garden. It was no quick goodbye. He loves to be recorded! I ordered a Trump 20/20 hat for him three weeks ago and it just arrived Monday! He said, "Take a picture of this! I put the tag up there so this can my Minnie Pearl look!" Here she is with her surgeon! I was posting updates and photos on Facebook and when Amber saw this pic, she immediately recognized the doctor. Amber went to school with her sister! It's such a small small world! Scheduled at 3:30, the doctor came out 45 minutes later and said everything went just fine. We arrived at 1:30 and it was after 7:00 when we left. Recovery takes a good while. We picked up Rx's on our way and Sherry (the lady whose home Summer lives in) had heated up the potato soup I had brought and had dinner all ready when we got home. She'd even made Summer's bed down! There was a gas fire burning in the fireplace, candles were lit and it was just about the coziest homecoming you could have. We all three gathered in Summer's room and ate together. I stayed until about 10:00 before coming back home. Summer was in bed and resting comfortably when I left and has continued to do well in recovery. One reason may have been the set of deep tissue injections she was given after the surgery to block the pain. This morning I got up early and had the coffee and breakfast all ready by 7:45! I took my brother, Lonnie, to the airport. He was flying to South Carolina to see his youngest son and his family. That's what Mother always called her one and only brother. I decided to go all out and hit up three thrift stores! In the first one I found a beautiful dressy white long sleeved blouse for Lillian! It looks brand new. With the Senior discount it came to $2.08! I'm going to take photos of my treasures tomorrow and show you where they 'live' now. The second store was Goodwill and I made a haul! A full basket that cost $32 total! I meant to get my eyeglass prescription filled. I have put it off for nearly a year and the Rx won't be any good after March! But it was getting late and I was tired and hungry.....so I will go do that on Thursday. I love a good old fashioned sandwich with Mayo, meat and cheese, lettuce and tomatoes, and bread and butter pickles! We had leftover potato salad and baked beans from Sunday so it made a good meal. What was even better was this cola drink I bought at Aldi back during the holidays. It was a seasonal item and I love trying new things. When Louis Dean cleaned out one of our little beverage refrigerator, I found lots of cool stuff I had forgot about. At 140 calories per bottle and made with pure cane sugar, I won't be drinking this every day. But it was seriously delicious!!!! Louis Dean and I are still working on the Christmas stuff. This late afternoon and early evening we concentrated on getting the lights down from the front yard and off the den windows. I even managed to prune several rose bushes while I was out there. I hung one of the wreaths I bought today on the stone wall above the porch bench. The other one hangs on the front door. I haven't fluffed them up yet. I'm going to add some extra flowers where some are missing and jazz them up a bit. 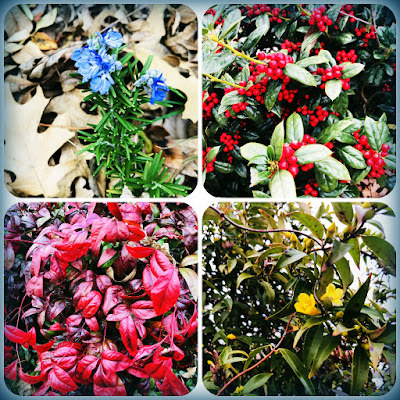 It not only feels like spring - it's looking like it, too!! 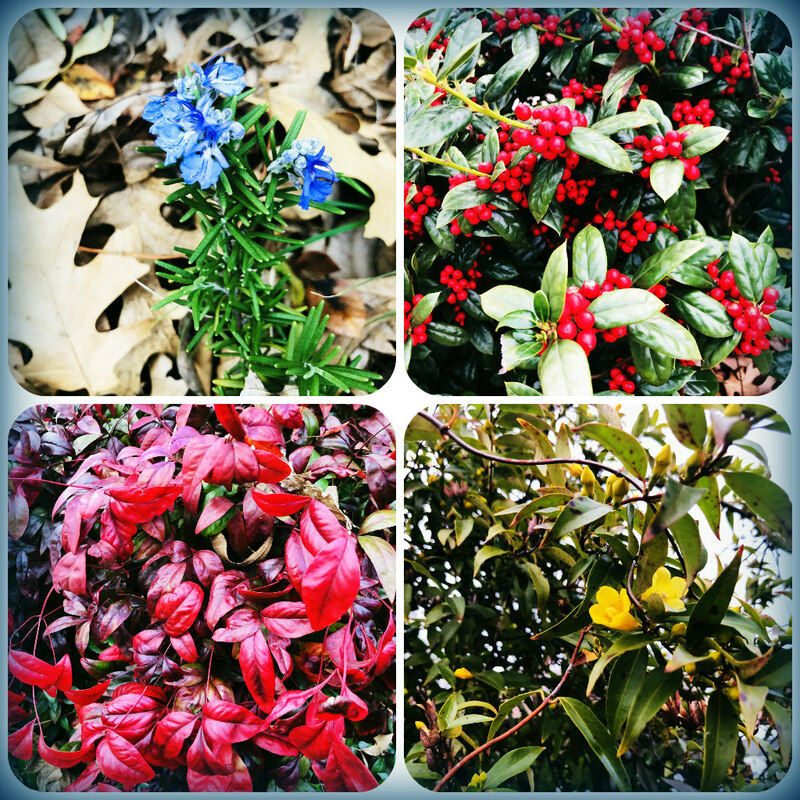 See the blue flowers on the top left pic? I had no idea that rosemary actually has blooms! I've never ever seen any before and I have had rosemary for many many years! Tonight we took a break from our projects and watched the State of the Union Address. 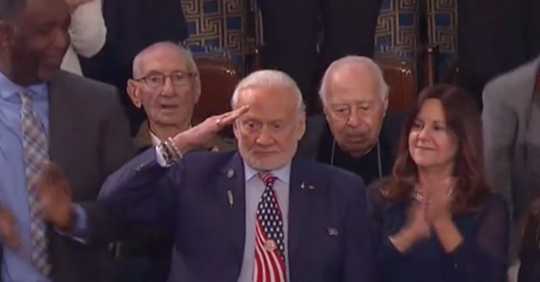 I loved see Astronaut Buzz Aldrin stand and salute the President. Such a good speech and so many wonderful moments. Made me so proud to be an American! I talked to Summer this afternoon and she continues to be doing well in recovery. The weather has been 80 here, too! I am so glad summer is doing well. I have never heard of these deep tissue injections; they must be something pretty new. Phil never had them for his hernia surgery. 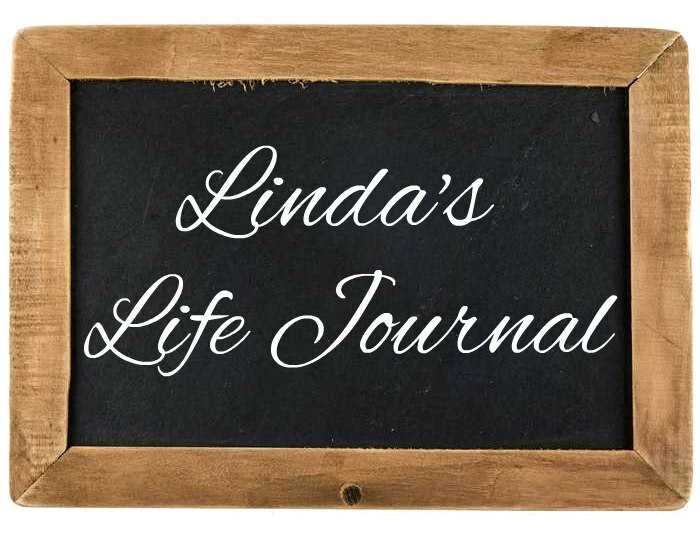 Your front door looks like spring, and is so pretty! I never knew rosemary had blooms either! And really pretty ones! Good report on Summer...she sure has had enough going on with her health. Praying for an excellent recovery. Lonnie is going to have a great time with his son and family. Loved hearing the bird and Louis Dean sing, but wish it were something else. Don’t tell him that! It's wonderful to hear that Summer is doing so well. That is such good news. Nice too to spend time with your brother even if it was to take him to the airport . I'm a firm believer of family time anyway I can get it. It' has been warmer here with temps close to 50 but no signs of spring, It's just nice to be thawed out from all the snow and ice. It's only February so I know we will get more. Come March I'll put out Spring decorations but I did get out a fake forsythia wreath for the door when I got Valentines out. It is one of the first signs of Spring around here. Looking forward to seeing all you Tuesday finds! Have a wonderful Wednesday! So glad Summer did well with her surgery and glad to see you getting back to your routine. I know that is hard after a loss. Tell LD that I LOVE his cap!! So glad Summer's surgery went well. I thought I heard a mockingbird this morning and was surprised. It seems so early! We had some lovely rain showers this morning here close to Ft. Worth. Did you have any rain? Glad Summer’s surgery went so well! What a treat to come home to a ready bed and hot meal. Sounds so cozy! Louis Dean is such a sweetheart. I went to a thrift store today and found a silver plated teapot and some books! I love Louis Dean's cap too!!!!!!!!!!!!!!!!!!! Man you got a haul at Goodwill - I keep wanting to get there - but I can't find the time right now and I am not sure why. You seem so incredibly busy. Nice for you to be with Summer on your surgery! Tell me more! I’ll be there if YOU are! Terre, send me a way to contact you because yes! I will be there! We did this last year and it was great! Flowers look wonderful! On the rosemary, old herbal lore says that the flowers of the rosemary shrub are blue because the Virgin Mary laid her blue cloak across a rosemary shrub blessing it and turning the flowers from white to blue. I'm a hopeless herbal lore nerd! Hope you are doing well! I love that herbal lore....and thank you, Shannon....all is well with my soul. That Louis Dean! He sure looks snappy in his new hat, Minnie Pearl and all! So glad Summer is doing well and aren't you the Goodwill shopper of all time! I don't have the skill to find treasures like you do although I'm a great donator. I love that you guys are a supporter of our President and country, it says a lot about the both of you!